White-backed Woodpecker, Honey Buzzard, Lesser Spotted Eagle – depending on the distance of each species by car and on foot, the weather and your endurance while sitting in the hiding-place. Wow, that sounded really good. This time, photography of young birds, on and around the nest was the target. Nest photography is a sensitive endeavor. Nothing to try by yourself. So I laid my fate again in the hands of Milos. Milos is performing guarding and monitoring the wildlife of the Carpathians in the Tatra Mountains for more than 20 years. First, Milos worked as a ranger for the Mala Fatra NP. Doing this job, he learned to climb trees with professional equipment. A job, which needs licenses in Slovakia, too which are renewed every year or so after having showed the necessary skills and knowledges. Now he is self-employed as a nature conservationists but is still doing research and monitoring for the various Nature und National Park authorities. In pursuing this job he has all the necessary permits inclusive entering the park roads and performing surveillance jobs also on nest of birds. 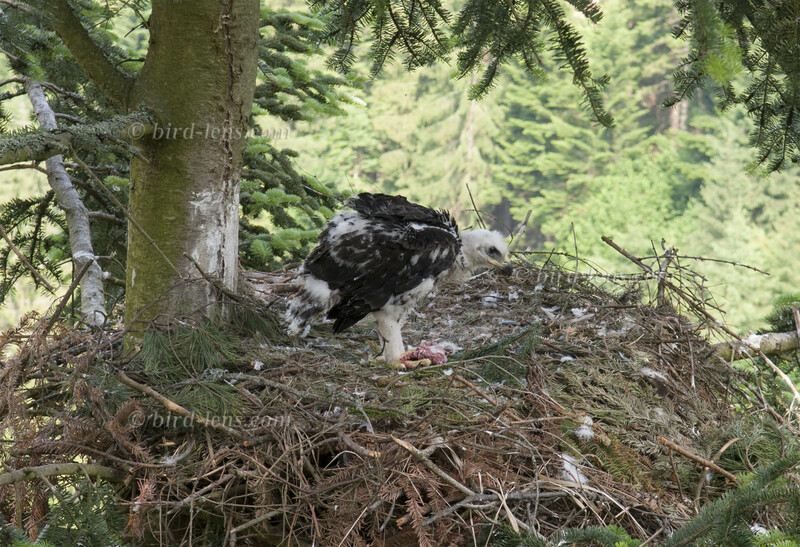 The results of the shooting of Carpathians birds of Slovakia in June you see in the Gallery. Passing Žilina I headed for the tourist spot Terchová. A narrow country road leads you down to Dolny Kuby. Sunny & hot. Meeting Milos und Jaro at 7:00pm in the hotel. We agree to meet again at 6:00 am the next morning for breakfast in the pension. Mala-Fatra-Mountains near Terchová. Searching nesting sites of Golden Eagle (Aquila chrysaetos) and Boreal Owl (Aegolius funereus), Sunny & hot with some thunderstorms elsewhere. Mala-Fatra-Mountains to the east, Veľká Lúčivná Visit nesting sites of Northern Goshawk (Accipiter gentilis) and in vain Pygmy Owl, Sunny & very warm, some thunderstorms nearby. Hills near Choč-Mountains. Visit nesting sites of Common Buzzard (Buteo buteo), Visit nesting site of Northern Goshawk (Accipiter gentilis) of day before. Clouds with some sun. Cooler than the previous days. Buffer Zone High Tatras Mountains. Searching the Wallcreeper (Tichodroma muraria) and other birds of limestone crags. Investigating birds of alpine meadows. 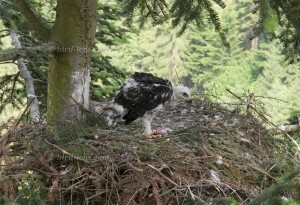 Afternoon: investigating nesting site of Lesser Spotted Eagle (Aquila pomarina) in hills near Choč Mountains. Clouds in the beginning with sunny weather afterwards, very hot in parts. In the morning Žilina mountains near water reservoir. Three-toed Woodpecker (Picoides tridactylus) at nest hole. Afternoon: investigating nesting site of Eurasian Sparrowhawk (Accipiter nisus) in Choč Mountains, photographing with interval controlled camera. Cloudy, very little sun. Showers, even heavy rain. Quite cool. Morning: change batteries and CF-Card of interval controlled camera at nesting site of Eurasian Sparrowhawk (Accipiter nisus) in Choč Mountains. After: Buffer Zone Malá Fatra. Searching the Lesser Spotted Eagle (Aquila pomarina). Sunny in the beginning with heavy clouds and some rain, sunny in the afternoon, warm in the sun. Morning: de-install interval controlled camera at nesting site of Eurasian Sparrowhawk (Accipiter nisus) in Choč Mountains. Rest of day: Buffer Zone Malá Fatra. Searching the Lesser Spotted Eagle (Aquila pomarina). Beautiful weather, with some clouds during afternoon, warm. Day of return. Sunny and warm. After visiting a spot near Terchová, drive via Žilina, Bratislava, Vienna back home. Nature und National Park authorities are very jealous for their natural assets – for good reasons. Thus, only licensed guides are authorized even to use most of the roads in the parks. For no reason, you should try the program you see above on your own. Fines are serious and costly. Additionally, this is bear-country. Another reason not to stalk alone through the forests. Tourists are allowed to move only on marked trails. Ranger Miloš is pursuing a job, which means that he has all the necessary permits inclusive entering the park roads and performing surveillance jobs also on nest of birds, but guiding you is not his main task. In so far, patience is absolutely essential but, see it as a real privilege, to join him, one of the real nature experts of the Carpathians in Slovakia. Some organization in advance is necessary to perform this kind of trip. I am considering doing this trip – but for other birds in a slightly different time window – in 2015 again. Pls. contact via contact form, if you are interested or need more details. Surprisingly uncommon, but a pair at the hole, young? Heard only, probably 1 ind. In total 77 species of birds. Not bad for one week!